Regional Institute of Co-Operative Management (RICM) was started in the year 1980 by the Government of Karnataka. It is an institution of National Council for Cooperative Training (NCCT) and is promoted by Ministry of Agriculture and Farmers’ Welfare, Government of India. The vision of the institute is to achieve excellence in managerial field for development of national economy through education in information technology and management. The mission is to produce professionals and industrialists through management training and education to improve creative and innovative thinking. 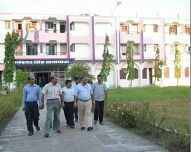 The institute covers 5.34 acres of campus with well-furnished hostel for male and female students, community center, recreation center and discussion room, conference and seminar hall, digitalized library, computer labs, well equipped classrooms and administrative and academic block. The construction of the college buildings was done with the help of donations provided with Government of Karnataka, Government of India and State level Cooperatives. The students are provided with serene atmosphere surrounded by coconut groves to achieve excellence in academics. The institute has Agricultural Cooperative Staff Training Institute, Janatha Bazaar, CICOPA, Karnataka State Cooperative Agricultural and Rural Development Bank Staff Training Centre, National Institute of Rural Banking, Rabindranath Tagore Statue and Late Sir R. Gundu Rao Statue. Is there any PG diploma course available ? I am a graduate student scored 60% in my graduation in b. com honors? Need admission dates of regional institute of cooperative management for MBA 2016? Are you Interested inRegional Institute of Co-Operative Management"? Please provide the following details.